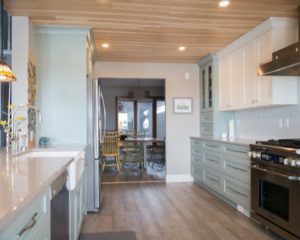 At Ekko Custom Cabinetry & Design, we often forget how much planning and organization the customer must commit to for a successful and enjoyable kitchen renovation. 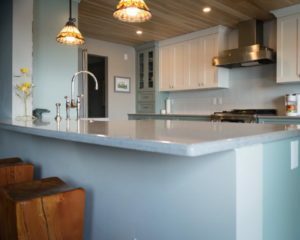 We were reminded of what all is involved by a recent article in Houzz written by Becky Harris September 9, 2018. We felt these tips would be helpful for the uninitiated and an overview of these preparation ideas would be appreciated as your renovation progresses. So, you’ve decided to remodel your kitchen. Congratulations, I can’t wait to see your before and after pictures when it is done. 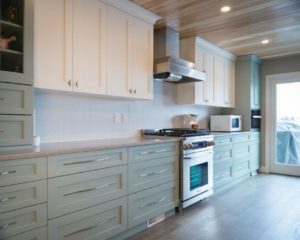 In the meantime, you need to know what to anticipate and How to Prepare For and Survive a Kitchen Renovation. Be Fully Aware of What is Going to Happen – it is going to be messy and it is going to be noisy. 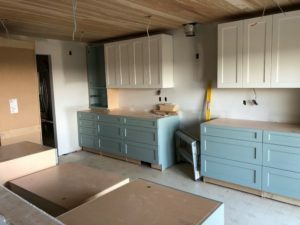 There is much work and preparation to be done before the new cabinetry is delivered and the obvious “creation” work begins. 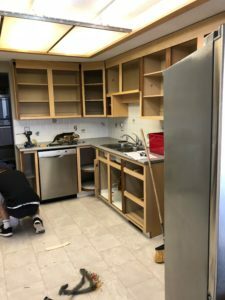 Removal of the old cabinetry, countertops, appliances …. 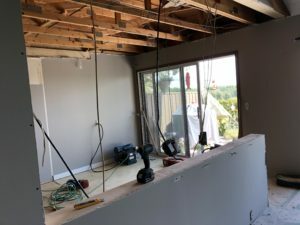 roughing in of new electrical (must be brought up to current codes) and plumbing ….. framing changes, drywall repairs, flooring preparation, etc. ……. the list is considerable. However, before any of that work can commence, you will need to clean out your old cupboards and prepare for your renovation. Now, is the time to “de-clutter” and consider what you want to dispose of (throw away or contribute to charity) and what you want to keep ….. also how you want your new kitchen to flow and function. Now is the time to consider the coming construction process and prepare yourself for life during the renovation. Remember, for the next few weeks, you will not have the luxury of a fully functioning kitchen. Life for the next few weeks will be like camping out – Spartan and if you reasonably prepare yourself (and family) you can make it a fun adventure. We don’t yet know why, but there will likely be some frustrating delays and unexpected changes. Concentrate on letting go of control because if you try to hold on to it, you’re in for a frustrating experience ………. Good time to learn the fine art of meditation. Get a referral list of good family restaurants serving a wide variety of cooking styles. Start collecting “take-out” menus. Get the “Skip-the-Dishes” phone number and the various restaurants they can supply from – by the time this project is finished you probably won’t be able to imagine wanting to dine at another restaurant in the foreseeable future. 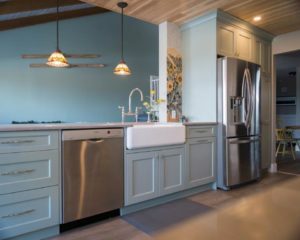 Make Preparations and Get Organized – determine where the best option for a make shift kitchen will be – if you already have a mini secondary kitchen or wet bar, you’re in luck. Otherwise, what is the best source for water and doing / storing dishes. Consider a facility for refrigeration, cooking and cleaning up. Make sure you have a place to plug in any / all of these components and an electrical service capacity capable of supporting these appliances. Consider what equipment might come in handy for preparing the meals you plan to cobble together while “camping” – coffee maker, electric kettle, toaster, toaster oven, slow cooker, portable electric grill, electric frying pan, microwave oven … maybe even a 2-burner infra-red portable cooktop ? Clean-up is ultimately the biggest challenge and having an easy access to a hot and cold water supply and dishwashing tub must be a primary consideration. Figuring out what not to pack is KEY to survival ! 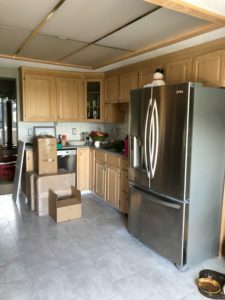 Once you box up your stuff, you likely won’t be able to find anything you need until after the kitchen renovation is complete and you are unpacking – too late to be helpful in survival mode. “What Not to Pack” Suggestions From “Survivors” - grilling tools, carving knife, bread knife, paring knife, cutting board, 2 or 3 platters, coffee mugs and/or tea cups, paper plates & napkins, ( 1 ) set of silverware and a complete place setting for each member of the family (you probably won’t encourage much company through this process), a few serving spoons, can opener, bottle opener, WINE OPENER (very important as time progresses), place mats and a tablecloth, large serving tray. Also remember coffee, tea, sweeteners, salt, pepper, favourite spices and condiments, pet food and bowls, wash cloths, dish towels, etc This is a pretty good start – don’t wait until the last minute to create this list and ask other members of the household if they can think of anything you might have missed. Here is your chance to experience a healthy “European” lifestyle were you get to stop by the market every day for that night’s supper provisions. Make meal planning and preparation a fun chore and try to involve everybody in the process. Your menu will quickly gravitate to easily prepared foods that you can cook or prepare indoors or grill on your outdoor BBQ. Soup, cereal and sandwiches may soon become the most appealing options. Buy stuff at the grocery store that is easily and readily consumed with a spoon. Keep dish detergent, a scrub brush and a dish towel at the designated cleanup “sink”. The designated food trash should definitely have a lid to contain odors and keep “pests” away. Stay on top of the cleanup process – scrape dishes into the trash, wash them, dry them and put them away in their designated spots as soon as possible – the task will seem less onerous if these cleanup chores are dispatched quickly and regularly. In the film “Under the Tuscan Sun”, the author’s advice for surviving a renovation is to “pick one room and make it yours”. Apparently, this concept is key to reno survival. Designate one room as your sanity-saving space. 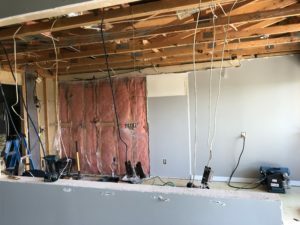 Be very clear with your contractor that this room is off-limits for cutting through and for storing tools or materials from or destined to the renovation. The best options are rooms that are not bedrooms and are not directly adjacent to the kitchen – construction noise can eventually be aggravating – especially after a few weeks. Be vigilant in defending this space – one day a request to store a small box or expensive tool, the next day could see 4 major appliances that arrived 2 weeks early. Regardless of your sustenance source, eating off TV trays from the sofa or picnicking on the floor will get tiresome fast. Consider screened in porches or patios during nice weather or a small table with a nice tablecloth when the need arises. If you’ve ever wanted to improve upon your grilling skills, this is your opportunity. Research recipes & techniques. Follow inspirational “grillers” on social media and try cooking things you’ve never tried on the grill before. Involve the kids and organize a “Master Chef Junior” type of challenge – believe it or not the kids will often enjoy the involvement – I didn’t suggest this would be less work for the adults. 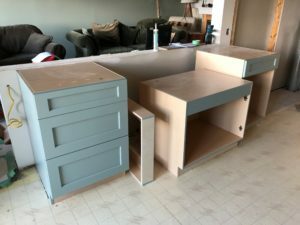 The Finished Project – The Wait Was Worth It !!! For more insight, watch for our January 2019 Blog …. 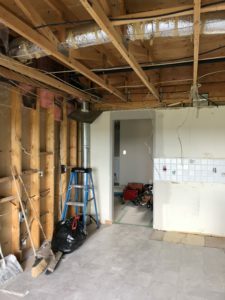 “I Didn’t Know What I Didn’t Know” with feedback and more things to watch for from one of our customers who just finished an extensive renovation, where she acted as her own General Contractor.